Two weeks ago, I compiled a list of the 5 jobs robots will take first. Last week, I compiled a list of the 5 jobs robots will take last. Both previous essays are about robots replacing human workers who do cognitive nonrepetitive work (such as middle managers, salespersons, tax accountants, and report writers) that most people do not believe robots will be able to do any time soon. For those essays, I defined robots as technologies, such as machine learning algorithms running on purpose-built computer platforms, that have been trained to perform tasks that currently require humans to perform. For this writing, let’s expand the definition of robot to any autonomous system designed to do work that used to require humans to perform. And let’s expand our thought experiment to include all four major categories of human tasks: Manual repetitive (predictable), Manual nonrepetitive (not predictable), Cognitive repetitive (predictable), Cognitive nonrepetitive (not predictable). In other words, let’s look at some probable futures of the real world and see where our conclusions lead us. Before being made eligible for assistance under the Universal Minimum Guaranteed Income Program Act of 2021 (also known as the “U-Min” bill, which guarantees workers displaced by robots a living wage), Joe was a professional driver. Agreed. A huge number of transportation industry professionals will be replaced by autonomous vehicles, and so will dispatchers, warehouse workers and the managers who manage them. That is the easy part. For our thought experiment, let’s replace just 20 percent of taxi, car service and truck drivers with autonomous vehicles. Now, let’s think about the businesses that service these workers. The local deli where the drivers used to stop for coffee. The attached convenience store that enables the gas station owner to run a profitable business (because there’s not enough margin in selling gas alone). The quick-serve restaurants, the supermarkets, etc. Let’s try to imagine a world where just 20 percent of transportation industry workers were laid off. Could the businesses that rely on these transportation workers survive the commensurate permanent decline in revenue? “This is nonsense,” you say. “These people will be retrained or find other jobs.” I don’t think so, but let’s assume you are right. The other jobs (whatever they may be) will have completely different traffic patterns (no pun intended). New behaviors will emerge and the impact of this massive behavior change will be about as pleasant as when the big box stores came to town and literally killed every mom-and-pop retail store on Main Street. Town survived, but it has never looked, felt or been the same. In practice, this is just the soundbite version of Robot Apocalypse. Let’s go deeper. Before qualifying for subsidies under U-Min, Joe was a CPA and a tax auditing partner at a Big Four accounting firm. With more than 15 years of experience working with some of the biggest corporations in the world, his entire department was replaced by AlphaAudit from Google’s DeepMind group. Interestingly, every partner in Joe’s practice area was earning more than $450,000 per year. Some were making north of $2.1 million per year. What will they do now? Where do you take 15–25 years of accounting experience and use it in a nonaccounting job? If you’re wondering about the driving force behind the Robot Apocalypse, it’s FOMO, “fear of missing out.” Making the converging trends of on-demand behavior, machine learning and autonomy actionable has gone from talking points to 40 percent of our business in under two years. All of our consulting clients are rushing to put autonomous systems and machine learning tools to work. It’s not that AI systems are “plug ’n’ play” – they are far from it. But I don’t know even one CEO who wants to wake up one morning to the news that a competitor has deployed an automated system that enabled a newsworthy increase in EBITDA. In a corporate world driven by earnings calls, that would be considered a very bad day. For this imperfect guessing game about the future, let’s take some real world financial statistics to benchmark the apocalypse. So, what would life be like if 20 percent of the one percent of Americans who pay 43.6 percent of all the federal individual income tax in the United States lost their jobs to robots? On one extreme end of the spectrum are common post-apocalyptic themes such as spotty power, energy shortages, food shortages, no running water, nonfunctioning schools, limited resources, reduced or nonexistent healthcare, etc. I don’t think this is where we’re headed. On the other extreme end of the spectrum is “Robotopia,” a place where humans have more time to do leisure activities, be creative, live life to the fullest, eat gourmet food, drink exotic vintage wines and spirits, practice the arts, and live under the protection of a master artificial intelligence, free from disease, free from fear, free from war … heaven on earth. I don’t think this is where we’re headed either. Somewhere in between these two extreme views of life after the Robot Apocalypse is where we are probably going find ourselves. It’s a world where the tax base has been severely impacted by the redistribution of workers. Wizened, experienced, lifelong professionals are going to find themselves in a new world that has no interest in them. New jobs will be created in industries that do not yet exist. And the physical world will be continuously adapted and optimized to favor autonomous systems that reduce cost, improve efficacy and increase productivity. Will we need my hypothetical, Universal Minimum Guaranteed Income Program Act of 2021? We might. Questions like “If we all lose our jobs, who will buy the goods that the robots produce?” are good ones. 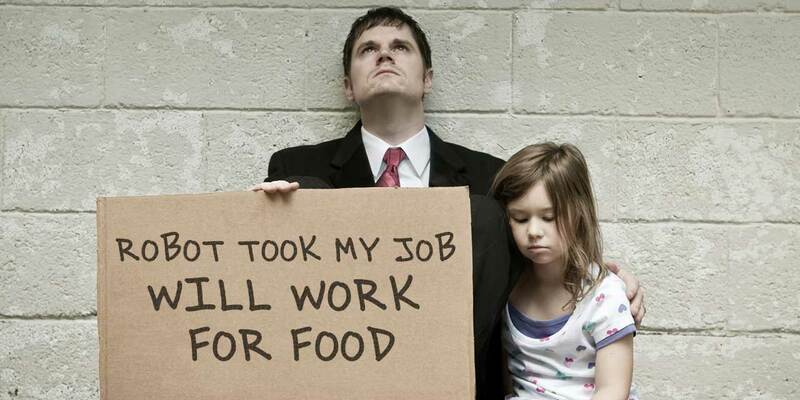 We won’t all lose our jobs, but a significant percentage of people will and, in the process, be rendered unemployable. That said, one friend of mine, who is a renowned public policy expert in D.C., told me that nothing was going to happen because we already have a nontaxpaying population explosion that is completely out of control. He opined that public assistance programs will simply continue to increase until no one except the top .05 percent of wage earners pays for anything. It’s time for policymakers to approach policy innovation the way our corporate clients are approaching their own digital transformations. As I’ve been saying for years, today we are experiencing the slowest rate of technological change we will ever experience for the rest of our lives. The pace of technological progress is not going to slow down, ever! FOMO is a powerful force that will continue to drive innovation. We get to choose what life after the Robot Apocalypse will be like. Let’s choose wisely. Can Machines Really Learn? – a primer in machine learning. AlphaGo vs. You: Not a Fair Fight – a lesson in artificial intuition. What Will You Do After White-Collar Work? – for personal preparation and a sense of timing. Digital Transformation in 7 Brain-Busting Steps – to adapt your business.